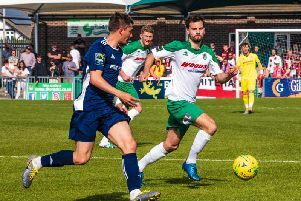 Burgess Hill Town suffered their first defeat since caretaker managers Simon Wormull and John Rattle took charge. Simon Wormull & John Rattle made two changes from the side who beat Haringey Borough on Saturday, re-introducing Dan Beck, and handing a debut to new signing, David Castanho. The Hillians started brightly, as Castanho almost instantly announced his arrival after just 4 minutes, but the midfielder just couldn't find the back of the net following a goalmouth scramble. On 10 minutes, Gary Charman forced Shane Gore into a smart low save from his drilled effort. The visitors grew into the game, and in the 20th minute almost took the lead, but Josh James was on hand to prevent David Manu's shot sneaking inside his near post. The 31st minute saw Beckles-Richards' effort rebound back off the post, before Rob Laney's rebound was once again saved well by James. The final chance of the half fell to Aaron Smith-Joseph, but Gore was equal to the wide man's curling effort. The host took the lead in the 50th minute, as substitute, Charles-Smith chased down Josh James' clearance, which fell to Beckles-Richards, who finished into an empty net. The momentum was with Wingate, as consecutive blocks by Elphick and Richmond kept the score at one nil. Tariq Richards was introduced by Wormull & Rattle to try and inject some pace into the Hillians. In the 62nd minute, Charles-Smith had the ball in the Hillians' net but was adjudged to be offside. Ibrahim Diallo was introduced for Gary Charman, giving the Hillians some needed energy. Dan Beck twice came close to equalising with two long range efforts. With time running out for the Hill, Tom Cadman had two free-kicks fly agonisingly over the crossbar. The Hillians huffed and puffed, but Wingate held out to claim all three points - in a game which had 'nil nil' written all over it. A disappointing evening for the Hillians, who would have hoped to have picked up a point from what was a scrappy encounter. The Hillians' MOTM was awarded to James Richmond, who defended resolutely all evening - alongside Gary Elphick.